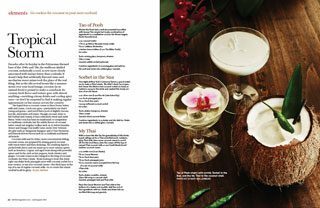 Decades after its heyday in the Polynesian-themed bars of the 1940s and ’50s, the stubborn-shelled coconut, technically a seed, is now more closely associated with suntan lotion than cocktails. It doesn’t help that artificially flavored rums and saccharine sweet mixes took the place of the real thing. But as the tiki revival looms like a summer storm over your local lounge, coconut (in its natural form) is poised to make a comeback. Its creamy, fresh flavor and texture goes with almost anything—enriching citrusy drinks and cooling spicy ones—so don’t be surprised to find it making regular appearances on bar menus across the country. The liquid from a coconut comes in three forms: water, milk and cream. Crack one open—particularly one that’s young and green—and you’ll find a pool of slightly viscous, low-fat, electrolyte-rich water. Though coconut water is full-bodied and creamy, it has a delicately sweet and nutty flavor. White rum has been its traditional co-conspirator in Caribbean cocktails, but the subtle flavors of coconut water round out singular vodkas, such as 42 Below Manuka Honey and Hangar One Kaffir Lime; exotic New Western dry gins, such as Tanqueray Rangpur and G’Vine Floraison; and Muscat-driven piscos, such as La Diablada and Barsol Alcholado. Coconut milk and its richer, more concentrated sibling, coconut cream, are prepared by mixing grated coconut with warm water and then straining. 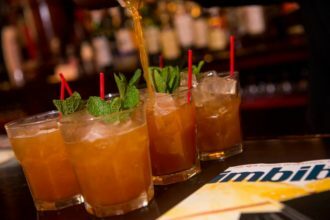 The resulting liquid is packed with flavor and can stand up to more intense spirits such as bourbon, Cognac and aged rums along with powerful spices and herbs, such as hot peppers, fresh cilantro and ginger. Coconut cream is also integral to the king of coconut cocktails, the Piña Colada. Those looking to treat this drink right can shake fresh pineapple juice with coconut sorbet for a lean version, or use true coconut cream—the thick layer at the top of a can of regular coconut milk—to re-create the classic cocktail in all its glory. Tales of the Cocktail is Back!